Yesterday I spoke at a luncheon (many thanks to MAGNY for a great event) where, during Q&A, a number of people commented on how difficult it is for those who grew up doing corporate bonds to try to cross over into muni-land’s veritable Oz. With all the talking trees and flying monkeys, munis can be pretty disorienting. And I’ve seen it happen many times myself; graveyards are indeed littered with the corpses of corporate types who come to munis and just never get it, both on the buy-side and the banker/sell-side. They show up bright-eyed and bushy-tailed talking about “benchmark this” and “OAS that” but ultimately wind up crouched in a corner mumbling something about 5 and 10 year bullets. I once asked a public finance investment banker and former bond attorney friend of mine why one of our former colleagues was going over to corporates. He replied bluntly, “I’ll tell you why. Corporates are easier.” Now I know I may be inviting some controversy here, and I certainly don’t want to minimize the challenges inherent in doing corporate bond work. Hitting the download button on those oh-so-promptly-filed 10k disclosures from Edgar can understandably strain the fingers, if not the wrist. But I think it’s time we call a spade a spade and try to address this problem head on in order to avoid any further needless human suffering. Now my experience is that the corporate species is able to handle the non-call bonds ok. Yes, the serialization of the first 10 to 12 years of the curve in a bond issue causes some angst. But they ultimately grasp that income to the investor is exempt from Federal, and potentially state income taxes. No, I think the bulk of the loss of life is caused by the $1.35 trillion in fixed-rate, unrefunded, callable munis outstanding today - and specifically the refunding analyses thereon. So let’s pull the curtain back on what really goes on with refundings and fully dispense with all the lovely little (over)simplifications that, although so elegant and applicable in corporate-land, just don’t cut it in Oz. The standard optional redemption feature that exists in tax-exempt bonds is owned by the issuer. So our real-world economic analysis must begin there. And modeling the issuer’s decision well (sitting down, my corporate friends?) involves 2, and possibly 3 entirely different markets. The initial cut for a tax-exempt issuer is to look at refundings on a matched maturity basis, replacing the existing bond with one of matched maturity, but presumably lower carrying cost. But if the existing bond isn’t first callable until some future time, the issuer also cares about the yield to the call date. But this isn’t the yield to call on the borrower’s yield curve. It’s the yield to call for the reinvestment of proceeds in a refunding escrow, usually SLGS or UST, an entirely separate and taxable market! It is this basis, tax-exempt to UST, which is a critical and non-trivial driving factor in a refunding analysis. And this gets even more complicated from the investor’s perspective. 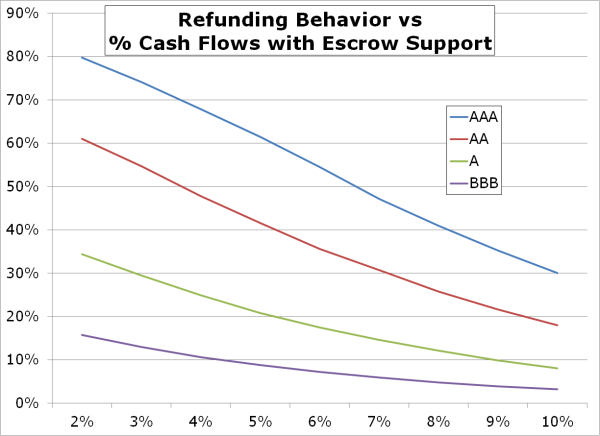 The issuer no longer really cares much about the refunded bond post refunding; that’s the responsibility of the escrow agent. But the investor now holds a security that still has the tax characteristics of the original bond, but is now riskless; it’s essentially a tax-exempt UST otherwise known as a “pre-re,” this brings in yet another yield curve. And last, if we’re dealing with a bond that is callable but ineligible for advance refunding (private activity or advance refunding bonds), we may be interested in the borrower’s taxable yield curve. So for a single bond from the investor’s perspective, a comprehensive analysis would begin by capturing the dynamics of not just 3 or 4 separate points on a yield curve, complicated enough, but 3 or 4 separate correlated but distinctly different markets. And these are markets that muni investors know, all too well, hardly move in lockstep. Does technology exist to model 4 separate but correlated yield curves at the same time, ideally perfectly capturing their historical dynamics? Yes! Doubt me? Test it free for yourself with CurveQuiz on either iOS or Android. Only with a model like this can anyone faithfully replicate the complicated decision dynamics issuers face. And we think is an essential tool for anyone, buy side or sell side, working in the tax-exempt markets. With that we can see things like average time to refunding, expected percent of bond payments that are risk-free (see below for a 20NC5 bond at different ratings), even the portion of value of the bond derived from the “credit pop” when a bond is refunded i.e. goes pre-re.